Lan Dinh comes from a family of Vietnamese refugees, farmers, and fisherfolk. Lan and her family first resettled in West Philadelphia and learned how to grow from her mother. She attended the University of Pennsylvania studying Health and Society and has eight years of experience working with food justice and youth. She is the Farm and Food Sovereignty Director at VietLead where she manages the Resilient Roots Community Farm with a high school youth program and elders. 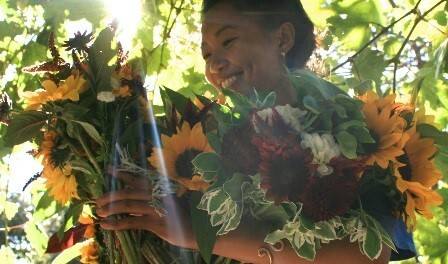 She also co-leads the SumOurRoots project, a collaboration between Cambodian Association of Greater Philadelphia, Bhutanese Organization of Philadelphia, and VietLead that is building a community farm at Furness High School and the food sovereignty power of South and Southeast Asians locally.